In an age where we are flooded with the opinions of others, it’s more important than ever to clearly, intelligently and respectfully state your case. The Joy of Argument is perfect for those who use discourse in their professional lives, or for anyone who wants to become a more effective communicator. Find The Joy of Argument for sale here, or ask for it at your favorite bookstore. 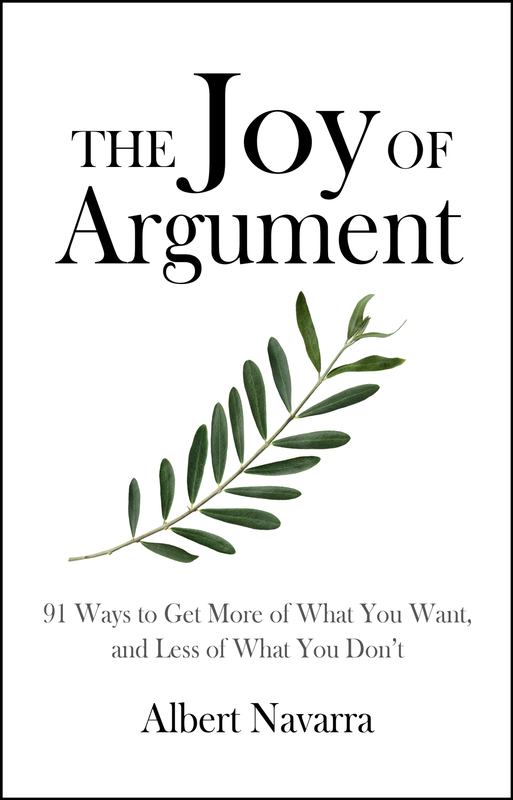 Interested in providing your own review of The Joy of Argument? Contact us here. 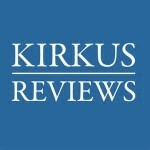 The Joy of Argument recently received a positive review from Kirkus. Read the review in its entirety below, and then pick up a copy of The Joy of Argument here. When you’ve finished reading, leave us your own review on Amazon.com or Goodreads.com. 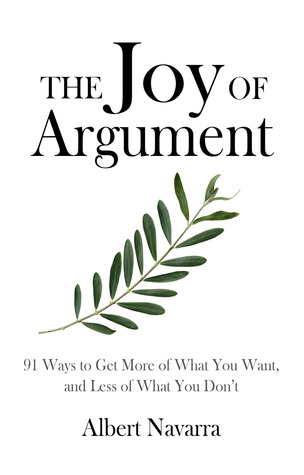 This well-crafted, lively book offers a plethora of ways to improve the art of arguing. “An argument…is a rational discussion in which you prove a point with reasons,” writes attorney Navarra (The Elements of Constitutional Law, 2011). Each brief chapter in this book is peppered with advice, and each is summarized in “The Key,” a one-sentence conclusion. Some of the tips seem self-evident; in “Pick Winners,” for example, Navarra advises, “Choosing the stronger argument increases your chances of winning the argument. But more than that, better arguments make things better.” Other chapters, such as “The Other Side of the Coin,” are somewhat more illuminating; arguments are stronger, the author writes, if they include a counterargument: “Thinking about new counterpoints will elevate your arguing skills to an extremely high level. This is one of the skills that separate the best arguers from the rest.” In “What Will Victory Look Like?,” the author offers a lucid explanation, with examples, of the difference between deductive and inductive arguments. Much of this book’s advice, though, is almost entirely revealed in its chapter titles, such as “Be Open-Minded,” “Watch Your Body Language,” and “Attack Arguments, Not People.” The result may be that some readers find it superficial and lightweight. However, if the author’s intent is to present his topic in supremely understandable terms, he pushes such simplicity to new heights. Navarra writes effortlessly and with total clarity, which will make the book breezy and enjoyable for many readers. In addition, his advice broadly applies to everyday interactions as well, and is often really about effectively communicating with others. Overall, this celebration of sound argument’s pithy remarks, lean sentences, and short chapters make it eminently readable. A decidedly simple guide to argument, written with understated style. If you are a reviewer or blogger who is interested in reviewing this compact guide to argument, contact us here. The Joy of Argument was recently reviewed by Jack Magnus for Readers’ Favorite, who awarded the book a coveted 5 star review. Read the review in its entirety below, and then pick up a copy of The Joy of Argument by clicking here. “The Joy of Argument: 91 Ways to Get More of What You Want, and Less of What You Don’t is a non-fiction self/help, business/philosophy book written by Albert Navarra. The author presents a definition of the term ‘argument’, shows how the concept evolved from its classical roots, and then proceeds to demonstrate how to make arguments work most efficiently and easily. Each of his methods is treated in a separate section which includes a presentation of the topic, a discussion and, where appropriate, illustrative examples of right and wrong ways to approach that situation, and a summary briefly condensed into a phrase or short sentence entitled “The Key”. Some of the topics include: preparing for an argument, maintaining an open mind, listening, and keeping the argument focused on a single issue at a time. The Joy of Argument by Albert Navarra is now available from all major retailers, in paperback and digital formats! Please leave an honest review of the book on Amazon or Goodreads when you finish it. We look forward to hearing what you think! 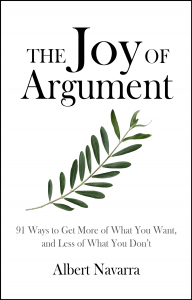 The Joy of Argument will officially be released to all major markets on November 1, 2015. Print and digital copies of the book will be available from all national retailers and select international markets, including Amazon.com, BarnesandNoble.com, Kobo and iTunes. Look for it online or ask for the book by name at your favorite neighborhood bookstore. If you’re unable to find the book on release day, or if you’d like to request a pre-release review copy, please contact us. Print copies of the book will be distributed by Ingram, and digital copies of the book will be distributed by Columbus Publishing Lab. Retailers should contact the distributors directly with any inquiries.